Andrews Tree Services are fully qualified arborists. 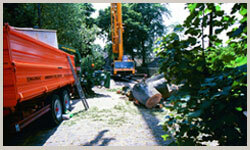 Established for 25 years we have the experience to provide quick and effective tree services. Our machinery and enables us to tackle larger jobs and even the most difficult landscapes are accessible with our heavy winching equipment. All our Unimog's are fitted with powerful mechanical winches. These vehicles are able to power equipment for lifting and processing timber. Our large capacity chippers enable us to dispose of tree waste and debris in an environmentally friendly manner. Our largest chipper has the capacity to handle trees and limbs up to 20" in diameter and our smaller standby unit having a 12" capacity. Our heavy winching equipment assists in felling and after felling extraction from site. Our stump grinding machinery consists of a large self powered unit 36" wide. Stump grinding transforms the tree stump into fine particles using a high powered rotating cutting head. 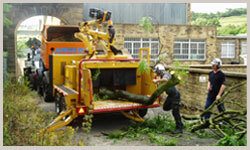 Andrews Tree Services are based in Ripponden, near Halifax, West Yorkshire. 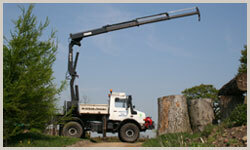 We are fully qualified tree surgeons, specialising in both domestic and commercial tree services. If you would like a free quotation please click here.